The Chronicle of Cultural Misandry: Women Control Over Half of all U.S. Wealth, Which Will Increase In Coming Years. 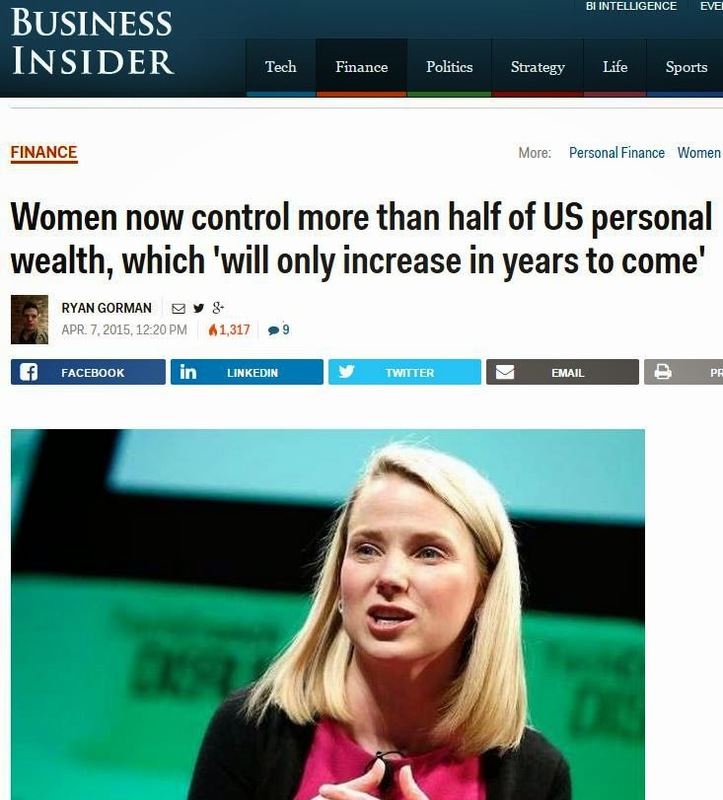 Women Control Over Half of all U.S. Wealth, Which Will Increase In Coming Years. "Women have overtaken men and now control more than half of all U.S. wealth and will likely take an even bigger piece of the pie in coming years, a new study has revealed. Moving up the ranks has made women the primary breadwinners in 40 percent of U.S. households yet they only earn 78 cents for every dollar when compared with men"
"According to all the media headlines about a new White House report, there's still a big pay gap between men and women in America. The report found that women earn 75 cents for every dollar men make. Sounds pretty conclusive, doesn't it? Well, it's not. It's misleading. Here are 8 reasons why the widely accepted and reported concept that women are paid less than men is a myth. The timing couldn't be better - today'sInternational Women's Day 2011. What better time to empower women with the truth instead of treating them like victims. And, in case you're wondering, Nemko's source of information is primarily the U.S. Bureau of Labor Statistics -rock solid. Men are far more likely to take work in uncomfortable, isolated, and undesirable locations that pay more.Men work longer hours than women do. The average fulltime working man works 6 hours per week or 15 percentlonger than the average fulltime working woman. Men are more likely to take jobs that require work on weekends and evenings and therefore pay more.Even within the same career category, men are more likely to pursue high-stress and higher-paid areas of specialization. For example, within the medical profession, men gravitate to relatively high-stress and high-paying areas of specialization, like surgery, while women are more likely to pursue relatively lower-paid areas of specialization like pediatrician or dentist. Women business owners make less than half of what male business owners make, which, since they have no boss, means it's independent of discrimination. The reason for the disparity, according to a Rochester Institute ofTechnology study, is that money is the primary motivator for 76% of men versus only 29% of women. Women place a higher premium on shorter work weeks, proximity to home, fulfillment, autonomy, and safety, according to Nemko.It's hard to argue with Nemko's position which, simply put, is this: When women make the same career choices as men, they earn the same amount as men. As far as I'm concerned, this is one myth that has been officially and completely busted. Maybe you should celebrate International Women's Day 2011 by empowering women with the truth instead of treating them like victims ... which they're not. "This study leads to the unambiguous conclusion that the differences in the compensation of men and women are the result of a multitude of factors and that the raw wage gap should not be used as the basis to justify corrective action.Indeed, there may be nothing to correct. The differences in raw wages may be almost entirely the result of the individual choices being made by both male and female workers."